Alexandros Ν. Angelopoulos, was born in Athens in 1972. He studied Business Management (Boston University 1995) and successfully completed his post-graduate studies in International management at Boston College (1998). He is Graduate of the PDP program of New York Cornell University (2008). 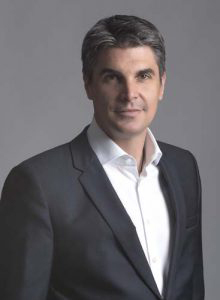 Currently holding the position of the CEO of Aldemar Resorts, Alexandros Angelopoulos has been active in the family business since 1995, working hard towards ideas and policies that open up new horizons in the Greek hotel business and place Tourism at the core of Greek economic activity. Alexandros Angelopoulos has been following with great interest the developments in the Business Ecosystem in Greece and the developments in Europe and he is very active participating in various organizations and committees representing the tourism sector and the entrepreneurship in Greece. Alexandros Angelopoulos is currently holding the position of Member of the Board of Directors and Chairman of the Environmental Policy Committee of the Hellenic Chamber of Hotels; Secretary of the Board of Directors of Hellenic Entrepreneurs Association; and Vice President of the Greek Eurasian Business Council. He is also a Μember of the Business Advisory Board of the BCA College and Honorary Consulate of Ukraine for Peloponnese.